Every morning, I manage to get up a little earlier (7:15-7:30) and catch an early bus/train combo so that I'll get into the city just in time to go totally out of my way to Faneuil Hall and get Starbucks. I love it when I do something - ANYTHING - before work. It makes me feel like I have more of a day to myself instead of just WORK. Today was no exception. While waiting for my coffee to be made, an older gentleman came over to me. I was listening to my iPod and shuffled through songs. He said, "Got a lot of messages?" and I chuckled. I didn't want to say, "No this is an iPod, idiot!" and he said, "You seem like you'd have a lot of messages! Phone calls, text messages, emails... coming through all day! I don't doubt it!" and I said, "Yeah." and laughed and smiled. "I really like your shoes! They're so bright and yellow. It's such a treat." "Thanks! Well, it's spring. Got to start dressing for it." "Yeah, I guess! Well, they're nice. You're a beautiful young girl." Then my drink was ready and I left and told him to have a nice day. It was a nicest interaction that I've had with strange men who talk to me in a very long time. And I get into a lot of awful conversations with strange men. 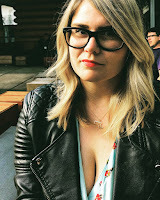 Like when I was at Trident last week looking through books and this guy came up behind me and creepily asked if I had a boyfriend and, I kid you not, asked if I'd like to join him in the bathroom. Listen guy, that's not the first time I was lured into a bathroom! Mr. Un-original, no thanks! I decline! 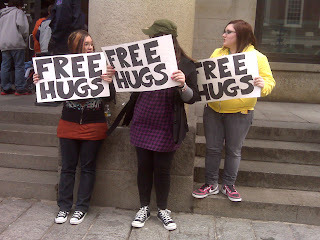 Also, in front of Starbucks, three young girls were giving out free hugs. I declined those as well.